Success is begging me to rename it to the 'eZine Profit Bible!'" Discover *exactly* how YOU can use my closely guarded techniques to cash in on the most effective eZine advertising ever invented! Free $200 Resell Rights License Included! 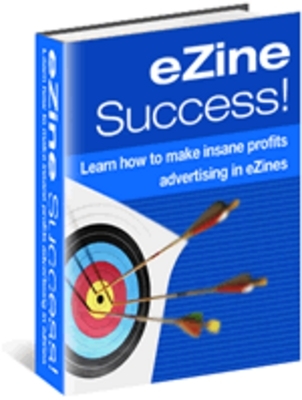 Sell eZine Success and keep 100 of the profits! You also have the ability to brand eZine Success with your affiliate ID's to the various sites mentioned in the eBook and sell it to others, creating a huge viral marketing effect! If you've been doing business on the Internet for any amount of time, you probably eat, sleep, and breathe the word advertising. What is the most effective form of advertising? Why is my advertising so ineffective? How can I advertise to double my profits? Advertising, advertising, advertising...it is the cornerstone of our business! The most effective form of advertising is eZine advertising...it is a fact. For years, my clients and I made huge profits placing ads in eZines, with the best results obviously coming from solo advertisements. Then one day, a light bulb popped on in my head...and I realized that even though I am advertising successfully, I am still not using eZine advertising to its fullest potential! I hate generalizations, but I've noticed a growing trend in relation to eZine advertising. This trend involves solo ads, and that solo ads are THE best form of eZine advertising. Well, this is not entirely true, and eZine Success will prove them wrong! Solo ads are not the only option, and are certainly not the most profitable one. Do you want to get at least 5 times the results that you would get from a single solo ad and for a fraction of the cost? I dont usually write to ebook authors but after reading eZine Success I had to contact you and tell you how much I learned from it. I am just starting the eZine advertising portion of my marketing campaign and you have readily compiled every thing I needed in one eBook! I have been successful in internet marketing now for over 5 years and I am quite confident that if I would have had this information when I started my net profits would be thousands more than what they are! Im off to take advantage of what I have learned. This eBook will take you from start to finish down the road to writing a meaningful report. It is with these small but powerful reports that you are able to get your advertisement in front of thousands of readers because of your "ByLine". Steven takes you by the hand and guides you step by step, word by word, as you complete the process of creating this report or eBook. He leaves no stone unturned as he guides you from start to finish. If you need to advertise, and who doesn't....you need this book! eZine Success is a powerful 15+ chapter eBook that will take you, step-by-step, into my eZine advertising world. ...nobody has had the guts to reveal these closely guarded secrets. Until Now! *Exactly* what hidden gift YOU possess that will increase sales, subscribers, and Profits! It's time you used this gift to profit like the "Gurus" have been doing for years. How to avoid paying for services that you could easily do yourself. Why not use this extra money to purchase some of my other products? 3 *eZine-Power-Techniques* that I have used in conjunction with eZine Success to make my sales explode! An eZine directory so extensive that you will make it your "One-Stop eZine Shop"
Why eZine Success is THE most *INEXPENSIVE* method of eZine advertising, and why it is by far the most profitable! Exactly how I can *Guarantee* that your advertisement WILL be read! No other form of eZine advertising can provide this type of guarantee. Why people subscribe to eZines, and how YOU can leverage this simple fact to your advantage...it's much simpler than you think! Exactly how the techniques in eZine Success will not only increase your sales, subscribers, and profits, but also your exposure and credibility! 4 *Never-Fail* steps for finding out exactly what people want to see and read about! If you follow these 4 steps, people will be stuck to your ad like glue. ...and this is just a small sample of the information you will find in the first 4 chapters! That's about 1/4 of the entire eBook! When I say "Jam-Packed," I really mean it! Here's one secret I will reveal to you here: A small part of eZine success involves writing articles. If this causes you to cringe, that's great! That's exactly why I decided to write eZine Success.